Gasp. I loved this book. Get it, read it, do it now! Er...okay, let me back it up. 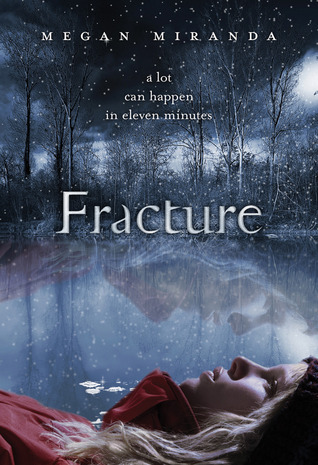 Fracture is the story of what a teenage girl faces after surviving a near-death experience that really should have killed her. And, oh yeah, there's some paranormal stuff too. Delaney Maxwell fell through the ice at a local pond in the middle of winter and it was eleven minutes before she was rescued by her best guy friend Decker. The story begins with Delaney waking up in the hospital and realizing what she has been through. As the story continues, the reader experiences everything Delaney goes through as she transitions back into her regular life and discovers something unusual about herself...she is now 'pulled' toward people who are dying. Delaney struggles to understand this, and to decipher whether she feels drawn to these people because they are dying or if they are dying because she is drawn to them. She also feels pulled by a different sort of attraction...to Decker. There have been underlying feelings between the two for a while, and after Delaney's almost death, both teens struggle to come to terms with these awkward feelings. Along the way, Delaney tries to learn how her 'new brain' works, finds out who her real friends are, and meets another who suffers from the same unnerving condition. But is he trying to help her, or hurt her? This story was amazing. I typically stick to all things paranormal, and the paranormal element here was light. This story was more about Delaney, Decker, and the other people, and not as much Delaney's new 'gift'. However, I was thoroughly entranced and impressed by new author Megan Miranda. Her writing style is smooth and real and I loved being inside Delaney's head. No part of the story was overdone. Despite the supernatural ability Delaney gains, Miranda still manages to keep the story fully realistic. I loved seeing how Delaney and Decker's relationship developed as the story went on and appreciated how believable the awkwardness was. It was exactly as one might expect real teenagers to act. I also loved how Miranda made me feel such a range of emotions when it came to another character, Troy. I felt pity, dislike, longing...and that was all in one chapter. Overall, is a must read this winter for paranormal and contemporary young adult fans (and perhaps even those who don't usually read young adult). An advance copy of this book was provided was Book Divas. Sign into Goodreads to see if any of your friends have read Fracture. 48.47% "So this ARC came in the mail and I was mildly interested in reading it. And I reread the description on the back and I flipped through the first chapter...and now I'm 127 freaking pages in. This story is amazing so far. I don't even know why, but I love it. Maybe it's the author's style or maybe I just like the main character, Delaney. Don't know, but this is one of those books you fly through in two days flat." 89.69% "So sad I haven't been able to read for a day and a half! Can't wait to finish this and see how it ends!" Dija - I really liked it A LOT. Its totally different than what I usually read so it was a nice palate cleanser. It comes out at the beginning of January. I want it.I want it.I want it.!!!! Can you guys see this review? Stupid sounding question, I know, but I had it hidden but all the sudden it seems as though people can read it now.